Founded as Butler’s Point in 1820, Catlin with a rich farming history, has been the long-time home of Midwestern families who work to keep the spirit of America alive. Ten minutes southwest of the county seat of Danville, the Village of Catlin with a population of 2,100 continues to prosper and grow. Catlin’s amenities coupled with a school system that is acknowledged as one of the premier educational systems in east-central Illinois, has created a long tradition of a family-friendly community. Catlin’s location near the economic center of Vermilion County along with its ease of travel to regional attractions and strong community pride has helped to foster a community that is large enough to serve you but small enough to know you! TAKE NOTICE that the Catlin Village Board of the Village of Catlin pursuant to “An Act regulating wages of laborers, mechanics and other workers employed in any public works by the State, County, City or any public body or any political subdivision or by anyone under contract for public works,” approved May 1, 2012, as amended has determined on, and as effective from May 1, 2012 that the general prevailing rate of wages in this locality for laborers, mechanics, and other workers engaged in the construction of public works coming under the jurisdiction of the Village of Catlin is the same as determined by the Department of Labor of the State of Illinois for Vermilion County as of June, 2012. 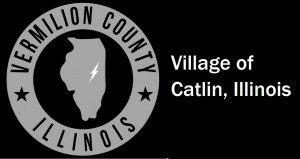 A copy of the full Ordinance and the Department of Labor determination is available for inspection by any interested parties in the main office of the Village of Catlin, 109 S. Sandusky., Catlin, Illinois, and to any employer or association of employers and any person or association of employees who have filed, or file their names and addresses, requesting copies of the same.